A huge thanks to everyone that has responded to our open thread last week, asking "What Do You Want to See in a Fine Writing Catalog." Among the comments on Facebook and Fountain Pen Network, I noticed that the two biggest concerns were large, detailed images of the items and measurements, including dimensions of the pen capped, uncapped and with the cap posted. While I would like to address all comments that were made in regards to improving the catalog, let's concentrate on these points first and continue the conversation later. Click for a larger view of the catalog page. Above is a sample page with Parker Pens featured. We sacrificed the ability to fit more pen lines on a page to make the hi-resolution pen images larger. In the case of the Parker Premier, which has a beautiful solid gold nib with a unique design, we included a zoomed-up shot to feature the nib. The Premier Stealth Black pen also shows the pen in the box, which is unique to the series. We take it for granted that we know most fine pens come in a presentable gift box, but we don't believe that readers are often aware of it. "As a guy who sells vintage pens and a few moderns, the time and effort needed to measure all of the pens, then record the data and make sure it got with the right pen, would be more than most vendors would be able to, or willing to, invest." He confirmed the dread I felt when it was suggested that meticulous measurements, including weight, be included for all pens in our catalog. Sometimes it's hard enough to bug some of the smaller, boutique brands to get hi-res images of the pens themselves, let alone detailed dimensions of each pen. So the onus will be on us to go through our entire inventory and capture these measurements, which we would do happily if it translates into our customers being able to use our catalog more confidently when making their purchase. 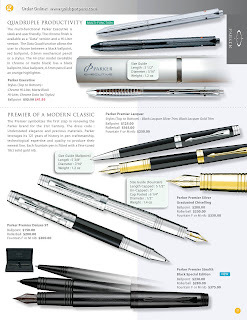 I am certainly curious to see if this will make a big difference with pen buyers. Please feel free to drop us a comment on this post, on our Facebook Fan Page or by tweeting us @goldspotpens. What do you think? Is this a move in the right direction? What other features could help give you the most detailed impression of each pen?